Mazda recently teamed up with CarAdvice, sponsoring a new ‘correspondent search competition’, to drive awareness of the new, 2015 Mazda MX-5. The competition began on 17 June with CarAdvice inviting readers to submit a car owner review, with the major prize offering a three-month paid job test driving and reviewing cars for the online independent automotive content publisher. From the entries received CarAdvice selected three entrants to go through to a final audition stage. For the competition final on 15 August, the three finalists were taken to a secret trackside location to test-drive three new Mazda MX-5s. The cars were put through their paces in front of competition mentors and judges, CarAdvice founder Alborz Fallah, former World Rally Championship driver Chris ‘Atko’ Atkinson, TV presenter Lauren Phillips and CarAdvice associate publisher James Ward. Finalists were required to attend a press conference and write a news story based on the proceedings, produce a video review of the new Mazda MX-5, and safely and accurately negotiate a MX-5 around a custom-made driving course. “The inaugural CarAdvice Correspondent has provided a terrific forum to help drive awareness of the all new Mazda MX-5. We enjoyed the approach that each finalist took in their review of the car and congratulate them all on their submissions,” says Karla Leach, senior manager – public relations, Mazda. CarAdvice this week announced Mandy Turner from Shepparton, Victoria as the ultimate winner of the competition, and its inaugural Correspondent 2015. Her new job responsibilities will includes travelling to the 2015 Tokyo Motorshow in October as part of the CarAdvice team. Mazda gave Turner and both of the other two finalists a new Mazda MX-5 as reward for their efforts. 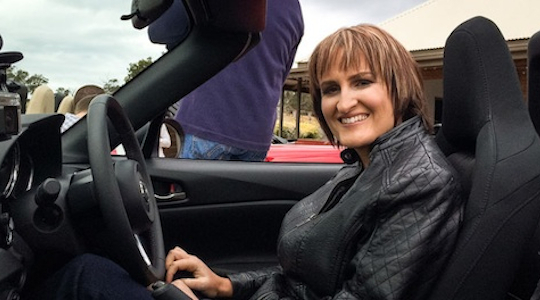 According to CarAdvice, Turner best impressed the judges with her video review of the MX-5, which focused on how the car fits a consumer’s lifestyle, while emphasizing its appeal as an affordable sports car. CarAdvice began as a blog project by Alborz Fallah in 2006 and has since grown to a team of over 30 reviewers with offices and test garages in Sydney, Melbourne, Brisbane and Perth.